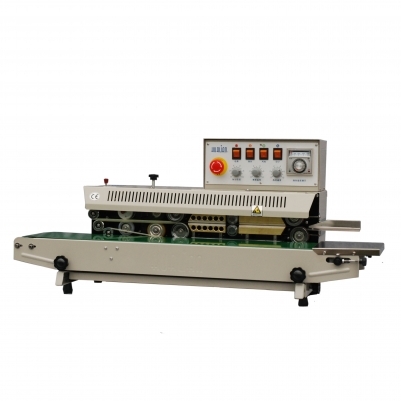 PRODUCT DESCRIPTION: FRQ-980 series continuous aerating band sealer can seal any heat-sealable materials. Apart from the function of gas filling, model FRMQ-980C adopts solid-ink coding device to print the colored label on bag while sealing. The print wheel equipped to the machine can be used for both R arrange and T arrange of types. For types in R arrange, the machine can print two lines in font size two (18PT) or three lines in font size five (10.5PT). If necessary, counting device can be equipped as well. FEATURES: 1.Constant temperature control and temperature is adjustable. 2.Step less speed regulation 3.Solid-ink coding is featured by high definition, various selectable colors, instant dry while printing, and strong adhesive property. APPLICATION: FRQ-980 series continuous aerating band sealer is applied to pack fragile or bulking objects generally.